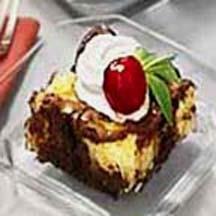 Cherries and cream cheese give these browniesa festive look and taste. 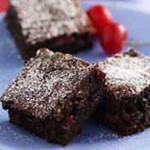 Drain cherries, reserving 1/4 cup cherryjuice. Put brownie mix in a large bowl. Add 1 egg, oil and reservedcherry juice; mix well. Gently stir in cherries. Set aside. Put cream cheese and sugar in a mediummixing bowl. 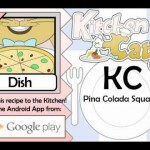 Beat with an electric mixer 3 to 4 minutes or untilwell mixed. Add remaining egg; mix well. Stir in coconut andalmond extract. Lightly grease an 8 x 8 x 2-inch bakingpan. 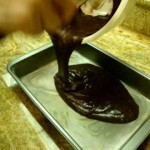 Spoon brownie mixture evenly into pan. 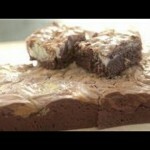 Spoon cream cheesemixture over brownie mixture. 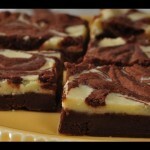 Use a knife to swirl cream cheesemixture into brownie mixture. 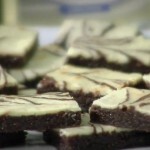 Bake brownies in a preheated 350°Foven 35 to 40 minutes, or until a wooden pick inserted near centercomes out clean. Let cool before cutting into squares orbars. Recipeand photograph provided courtesy of The Cherry Marketing Institute. 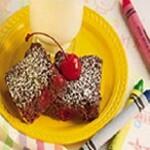 If the Cherry Cheese Brownies recipe was useful and interesting, you can share it with your friends or leave a comment. So I was thinking of my love for Black Forest desserts and cherry cheesecake and thought I had better start experimenting with some Black Forest Cheesecake Brownies for Valentine s Day. How was that for a tangent or five?